There's an ancient Egyptian legend that describes how tourmalines got their amazing colors, and it goes something like this... On their long voyage up to the surface from the center of the Earth, tourmalines passed through a rainbow — and by doing so, assumed all of its colors. The name "tourmaline" is derived from the Singhalese words "tura mali," which mean "stone with mixed colors." In fact, when it comes to color, tourmaline is the undisputed champion of the gemstone world. One of our multicolor favorites is called "watermelon tourmaline" because it features green, white and pink bands that look very much like a slice of the delicious summer fruit. Designers love to use thin, polished cross-sections of watermelon tourmaline in their work. 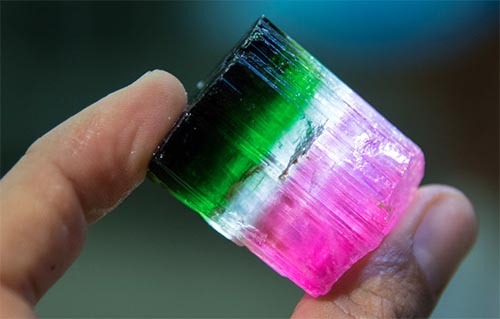 Gem collectors love watermelon tourmaline because it's fun and so unusual. According to the American Gem Society, the multicolor gems with the clearest color distinctions are the most highly prized. The trade has unusual names for the wide variety of multicolor tourmalines. According to the International Colored Gemstone Association, colorless crystals with black on both ends is called "Mohrenkopf," a chocolate-coated marshmallow treat sold in the German-speaking part of Switzerland. Tourmaline crystals that have banded color zones that lie on top of one another are referred to by the Brazilians as "papageios" or "rainbow tourmaline." 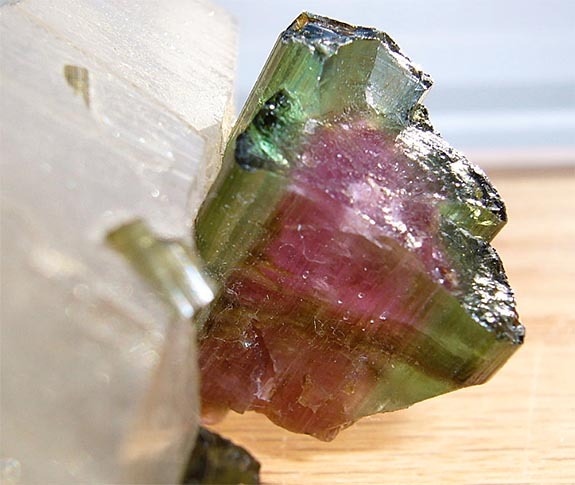 A tourmaline with red on one end is called a "Turk's head tourmaline." Apparently, the reference is a nod to the red fez cap made popular in Turkish culture. Tourmaline is found many locations around the world, including the U.S. (mainly California and Maine), Brazil, Afghanistan and East Africa. Tourmalines get their color from trace elements that are introduced to gem's chemical structure. Lithium-rich tourmalines yield blue, green, red, yellow and pink colors, while iron-rich tourmalines are black to bluish-black. Magnesium-infused tourmalines tend to be brown-to-yellow in color. Multicolored crystals reflect a "fluid chemistry" during crystallization. Credits: Photo (top) via Wikimedia Commons, CC BY-SA 3.0.; Photo bottom by Andrew Lucas/GIA, courtesy Cruzeiro mine. 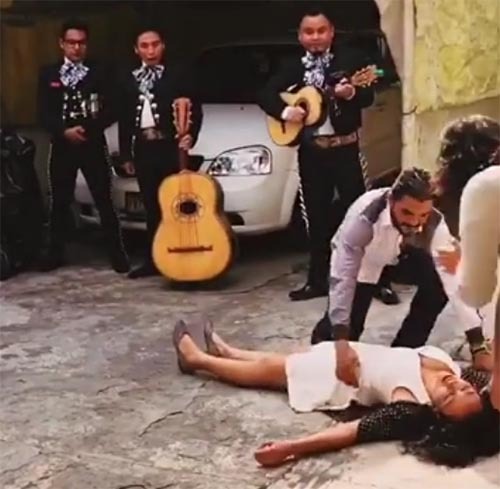 A Mexican bride-to-be became an internet sensation this week when the 7-second video of her fainting during a marriage proposal went viral on Facebook. 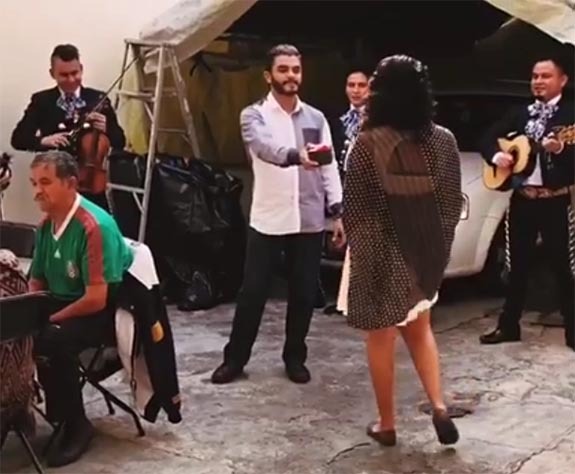 In a clip viewed by more than 4.4 million Facebook users, we see fashion model Reyna Renteria overcome with emotion when boyfriend Germán Benitez of Mexico City surprises her with box containing an engagement ring. 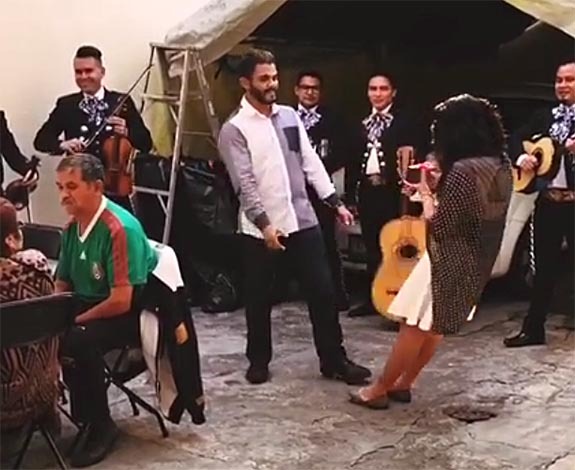 The scene opens at an outdoor café where a mariachi band is serenading the couple. Renteria walks toward her boyfriend as he presents her with the gift box. She accepts the box, and holds it with two hands. In an instant, the blissful moment takes a scary turn when Renteria blacks out and stiffly falls backward onto the ground. 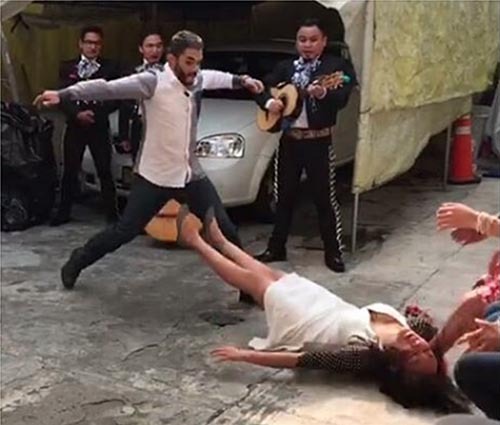 Benitez is shocked as his fainting girlfriend falls away from him. Benitez tries to catch her, but all he can do is quickly come to her aid after she hits the ground. 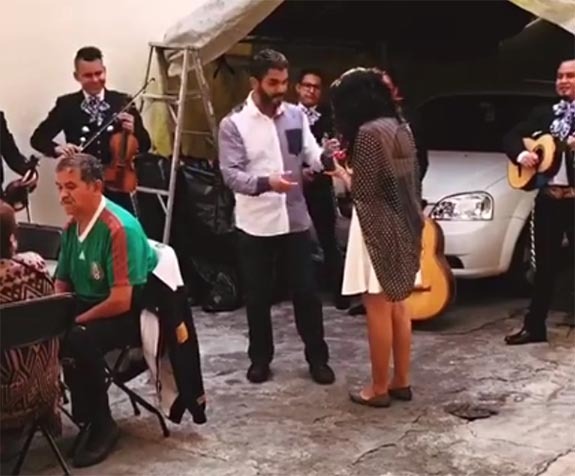 Oddly, one of the mariachi guitarists continues to strum his instrument despite the drama playing out in front of him. Fortunately, she was not hurt, just slightly embarrassed. Renteria posted to her Facebook page a still shot of herself lying unconscious on the ground. 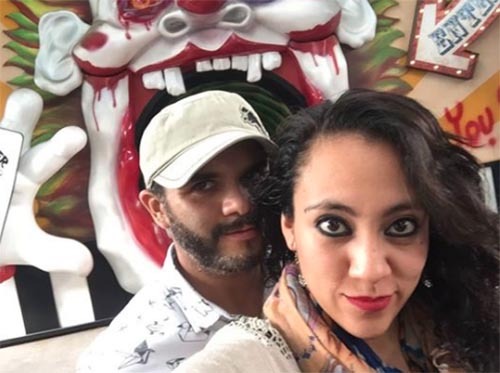 In the caption, which was written in Spanish, she promised to post the short video of the event if the photo earned at least 100 Likes. It quickly got 2,000 Likes. 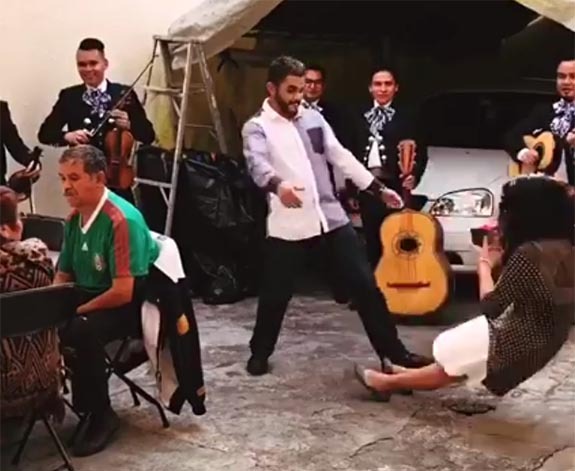 Barely an hour later, the video made its debut on her Facebook wall and the rest is history. The item earned 4.4 million Views, 64,000 Shares and 20,000 Likes. The story was covered by numerous news outlets, including The Daily Mail and Fox News Latino. Renteria's new handle on the social networks is "LadyCompromiso," which translates into "LadyEngagement." The Daily Mail is reporting that several companies have contacted the couple with offers of wedding-related items and services in return for mentioning their brands on social media. Credits: Photos via Reyna Renteria/Facebook. Back in February, a thumb-shaped 404-carat gem-quality rough diamond miraculously found its way through a hole in the sorting screen at Lucapa Diamond Co.'s Lulo processing plant in Angola because it was oriented vertically, not horizontally. Had the gem — which was eventually sold for $16 million — passed through lying flat instead of standing up on edge, it would have been rejected and discarded. It would have likely joined the other rejected, oversized "rocks" Lucapa had collected and used to fill the road beds throughout the Lulo project. The diamond recovery plant had been configured to capture diamonds up to 280 carats in size. Before that day in February, no rough diamond larger than 278 carats had ever been pulled from the mine. 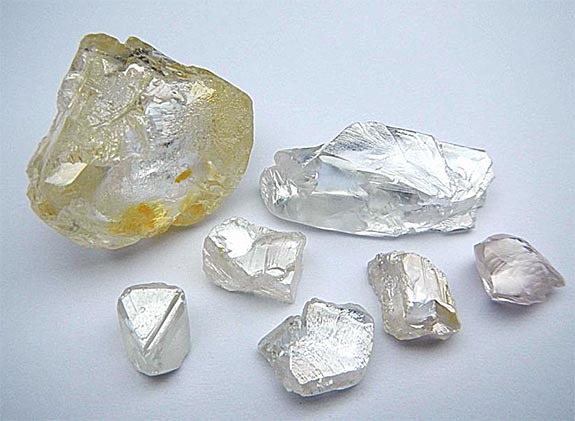 Now, the Australian Business Review is reporting that Lucapa executives have good reason to believe that the roads surrounding the Lulo mine may be literally paved with diamonds. Lucapa chairman Miles Kennedy is affectionately calling them "the diamond highways." 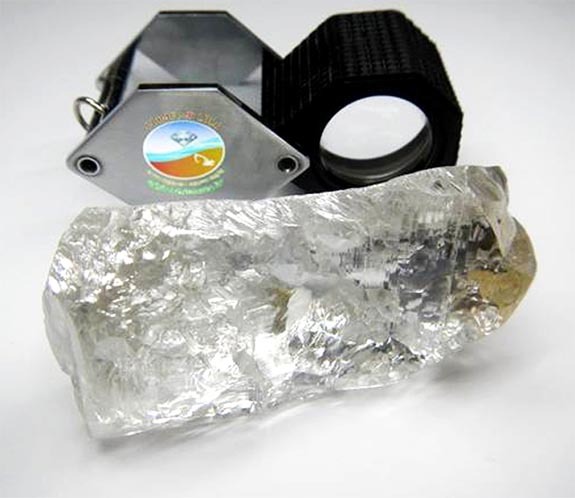 Lucapa is betting that many more mammoth-size diamonds were rejected in the sorting process and ended up as road filler. The company is looking into the prospect of digging out the road material and reprocessing it through a new sorting machine that can recover diamonds up to 1,000 carats in size. The new machine will go online next month. Lucapa has been stockpiling potentially diamond-rich oversized material since February's spectacular find. The Australian Business Review reported that the stockpiled material will be sorted first, and if more giant stones emerge, the roads surrounding Lulo will be dug up next. The Lulo Diamond Project in Angola already has earned a reputation for producing very large, high-quality rough diamonds. 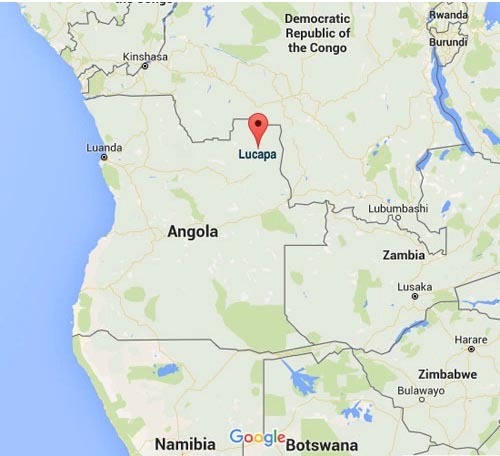 Lucapa has found six stones weighing 100 carats or more, including two in the past few weeks. The most recent find was a 172.6-carat D-color, Type IIa stone, the purest of all diamonds because they are composed solely of carbon with virtually no trace elements in the crystal lattice. Earlier this month, Lucapa unveiled a 38.6-carat fancy pink diamond from Lulo, offering the possibility that the mine could become a prime source for all varieties of fine-quality diamonds. Credits: Diamond images courtesy of Lucapa Diamond Company; GoogleMaps.com. Every once in a while nature delivers something so unusual, so spectacular that even the curator of the Smithsonian's National Gem Collection is impressed. 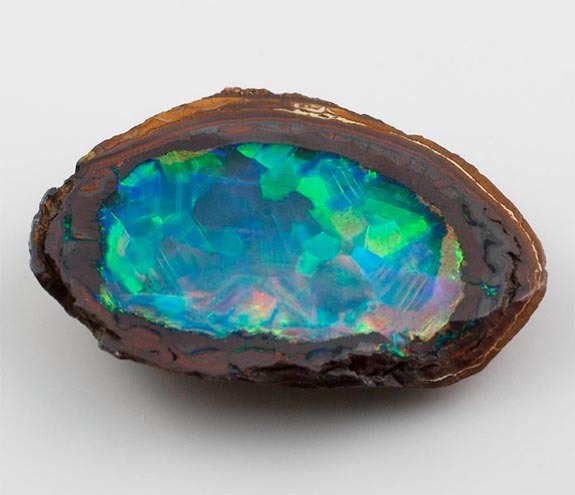 In January of 2011, the National Museum of Natural History in Washington, D.C., welcomed its newest resident, the "Yowah Nut Opal." It weighed 29.83 carats and, at first glance, looked like a nugget of rusted metal. A cross section of the Yowah Nut revealed a gem-quality opal hidden inside. This is certainly nature's most surprising example of October's official birthstone. "It reminds you that the earth is a pretty amazing place and we haven't seen everything yet," stated Jeffrey E. Post, Ph.D., curator of the National Gem and Mineral Collection. "There's always a surprise waiting for us in the earth somewhere and this is just a great example of that kind of a surprise." 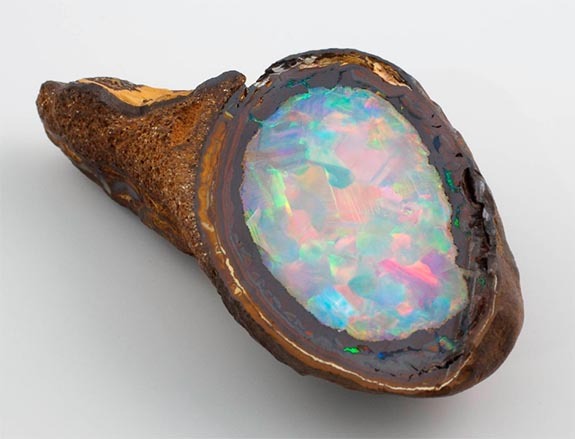 Post added that the donor who contributed the Yowah Nut Opal to the Smithsonian called the specimen his "OMG opal" because every time he would open it up, somebody would say, "Oh, my gosh." "And we have the same reaction," Post said. Yowah Nuts — the largest of which are 20cm (7.8 inches) across — are found exclusively in the Yowah opal field, which is located in Queensland, Australia. According to the Smithsonian, opal dealer Bryan Rossiter discovered the field in the 1880s. Opal mining was extremely challenging because of the intense heat, extreme drought and the lack of vegetation. Opal miners learned to keep their eyes open for ironstone nodules, or concretions, that looked like nuts. 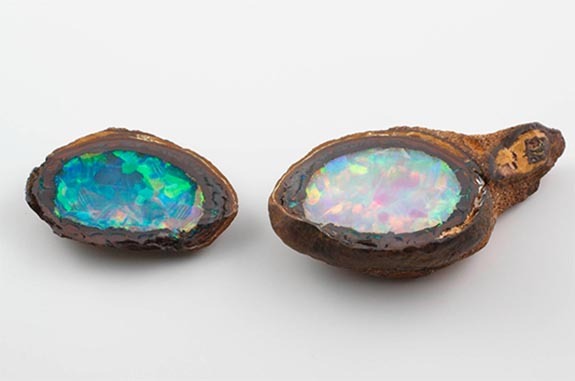 When cracked or sliced in half, some "nuts" would reveal a valuable gem opal in the center. The Yowah Nut on display at the Smithsonian was a gift of the Texas-based Richard Ashley Foundation. 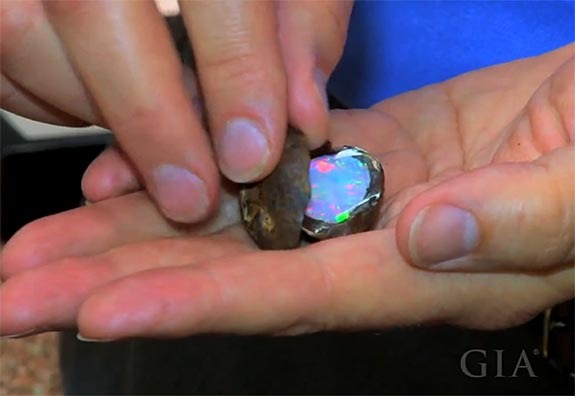 Rod Griffin, the miner who discovered this opal nut, told the Smithsonian it is the finest he has unearthed to date. The gem displays flashes of red, orange, yellow, green, blue and purple. One side of the Yowah Nut has a bluish body color while the other side is more milky in tone. Post explained that the difference in color is attributed to the thickness of each slice. Post talks about the gem in great detail in this video posted at the Gemological Institute of America's website. One of October’s official birthstones, the precious opal is universally loved because it often presents all the colors of the rainbow. Each opal is truly unique and more than 95% of fine opals are sourced in Australia. Scientists believe that between 100 million and 97 million years ago, Australia’s vast inland sea, which was populated by marine dinosaurs, began retreating. As the sea regressed, a rare episode of acidic weather was taking place, exposing pyrite minerals and releasing sulphuric acid. As the surface of the basin dried further and cracked, silica-rich gel became trapped in the veins of the rock. Over time, the silica solidified to form opals. Credits: Photos by Ken Larsen/Smithsonian National Museum of Natural History/National Gem Collection. Video screen capture via GIA.edu.